First mix instant coffee powder and sugar in boiling water and allow few times to cool. Then blend well the coffee mixture and milk in a blender for few seconds. And now add cream and crushed ice. Blend for another few seconds till it becomes frothy. 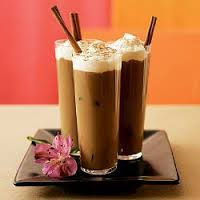 Finally serve this cold coffee any decorated glass or bowl.